Danielle Klaudt and Emily Grace Brook in the Realwheels Theatre production of Act of Faith. Photo by Caspar Ryan. Familiar to all who struggle to overcome their limitations are expletives such as “Good job!” and “You’re an inspiration!” The tongue-in-cheek proliferation of such expressions throughout Janet Munsil’s Act of Faith, presented by Realwheels Theatre at the Cultch, suggests that they might seem patronizing and cliché. 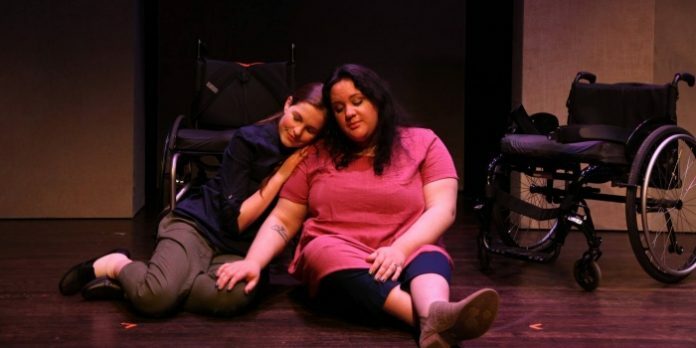 Ergo, one hesitates to applaud the courage, determination and stamina of several wheelchair-bound performers who give their all for over two hours in this play about the connection between healing and faith. So let’s begin with the negatives. The production, directed by Rena Cohen, could benefit from editing, particularly when it comes to scenes such as the dream sequence featuring Jesus Christ (presumably), as he washes the feet of the lead character, Faith, who is paralyzed as a result of an illness contracted in her earlier life. Perhaps a different approach to the depiction of Faith’s deity and religious visions instead of the silent, hooded figure draped in white sheeting, pointing to the future like Dickens’s Ghost-of-Christmas-Yet-to-Come, might tighten the first act. Something along the lines of the on-screen projections, used at the outset of the play to illustrate the teenage paraplegic’s faith, might serve. Danielle Klaudt is well-cast as Faith but her portrayal of her character’s miraculous cure lacks credibility when she takes her first steps. If her concentration were to focus on reaching her goal rather than her struggle to walk, it might clarify whether she is frightened, in pain or simply about to lose her balance. The old actor’s note applies: instead of trying to appear drunk when portraying an inebriated character, play a drunk trying to appear sober. Admitted. Teens gabble. But unless Faith and her best friend Jess (Jessica) slow down and articulate, the strain of trying to catch garbled, often inaudible lines will exhaust any audience by intermission. Act of Faith is a truly ensemble piece. It opens with a dance that is beautifully choreographed by Carolina Bergonzoni, to a perfectly synchronized musical accompaniment designed by Matthias Falvai, and performed by five actors slaloming through and around each other’s wheelchairs. As a result, the audience is eased into joyful acceptance of the genre. Emily Brook who plays Jess obviously uses humour in her personal life. Her comedy timing delights. So does the powerful performance of seasoned actor Tanja Dixon-Warren, as Jess’s mother Gloria who tells it like it is. Mason Temple, as Faith’s wayward brother Damon, also displays a unique comedy sense and Raugi Yu gives a convincingly sensitive performance as Jess’s, and ultimately Faith’s physiotherapist, Raff. Harmanie Taylor and Janice Laurence make a solid supporting cast. David Roberts’s tall vertical blocks comprising his set adapt flawlessly to constant scene changes, while making access to entrances easy for the five wheelchairs that whiz on and off stage throughout the performance. Act of Faith doesn’t merely highlight the challenges faced by those with disabilities. Nor does it stop at the strength and healing that faith, of any colour or creed, can offer. It also explores the pain that perceived betrayal and the subsequent response to it can create. At the risk of sounding patronizing and cliché, these acts of faith make for a good job, an inspiration and a powerful piece of theatre. Act of Faith by Janet Munsil. Directed by Rena Cohen. A Realwheels Theatre production on stage at The Cultch’s Historic Theatre (1895 Venables St, Vancouver) until April 20. Visit thecultch.com for tickets and information.